There are many places you can get your lumber. We get that. But the fact is that our customers can get their lumber other places, too. But they don’t. So we’ve asked them why they buy from us. We think the four basic reasons we heard over and over offer a pretty compelling argument for others who are considering various lumber suppliers, too. So if you’re wondering what sets J. Gibson McIlvain Lumber apart from the competition, here’s what our customers think. We’ve been doing this a while. We’ve been immersed in the world of lumber before you were born, or even before your great-grandparents were born. Since 1798, we’ve been in the lumber business. That doesn’t mean we’re not changing and developing; in fact, we’re still building on our previous knowledge as we venture into new facets of the lumber industry, such as hardwood, plywood, softwood, and NuCedar products. Over time, we’ve developed a vast amount of knowledge of various species, and we know what each species looks like and how each species reacts to various environments as it transitions from the forest to the mill, then to our kilns and ultimately to your job site. The kind of expertise we’ve honed isn’t merely academic; we understand the way it applies to us as we mill, store, and transport your lumber. We also use our knowledge to advise customers about the lumber species that best suits their applications or ways to value engineer the job to save you money, effort, or both. As an Importer of Record, we’re able to offer our customers excellent quality, superior selection, and competitive pricing. In today’s climate of Lacey Act regulations and environmental concerns, J. Gibson McIlvain lets our customers breathe easy. 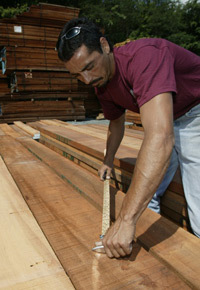 As an Importer of Record, we simplify the supply chain by buying all our lumber directly from the source. 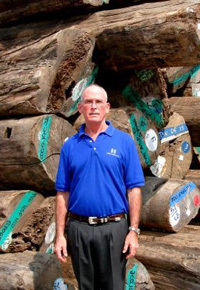 As such, we ensure full provenance and can vouch personally for the fact that the lumber we sell you has, without question, been legally harvested, handled, and shipped. Upon request, we can provide full documentation, as well. After reading about only two of the four main reasons our customers keep coming back to us, we hope you’ll be ready to join them. If you want to read about the other two reasons, though, continue here.